Every week MusicRadar trawls YouTube to bring you the greatest, funniest, weirdest and most interesting music clips and videos on the internet. The fifth installment of our weekly round-up contains everything from SynthAxe to a super funky rendition of Stevie Wonder's Superstition. Remember the SynthAxe? Don't worry, MusicRadar barely does. From the That's Just Wrong Department, we feature a great guitarist playing something that looks like a piece of dentist's equipment. Victor and his brother ‘Futureman´ Roy Wooten go crazy at a Béla Fleck And The Flecktones gig. Watch to the end and you´ll see what we mean. Is this a frightening hint at Guns N´ Roses´ new direction? Those of you with keen eyes will also notice Steve is playing a three-necked guitar. The Scottish songwriter is famous for her use of loop pedals live; she cooks up a version of Missy Elliot´s Get Ur Freak On here. Behold… The Arctopus display a bewildering disdain for regular time signatures. And regular band names. Archive footage of the legendary producer going through his box of tricks in “a recording studio that even NASA can´t match”. See Anchorsong - AKA Masaaki Yoshida - creating a track live using just an Akai MPC2000XL and a Korg Triton. How easy was it to for him to sample a Daft Punk record for his hit single Stronger? This easy. MusicRadar favourite Stevie Wonder grooves through an obscenely funky Superstition - possibly better than the album version - in 1973. It's a tie, they're both awesome. More important, consider the poor roadies. Can you imagine having to tune these set-ups? There´s only one winner here. 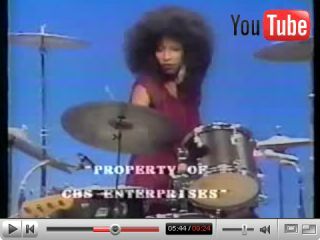 We even didn´t know she could play the drums! Three of the world´s best drummers… playing at the same time. The Foo Fighters and Nirvana man proves that you´re never too old.